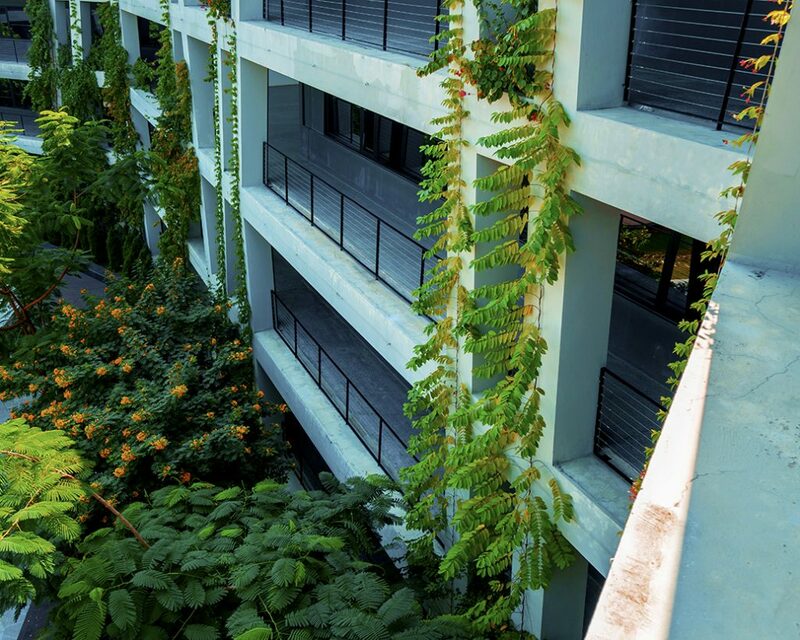 Growing mysteriously from the ground, concrete columns move rhythmically, branching and wrapping the four levels of the courtyard building. Concrete Lace is illuminated by the soft golden light of the setting sun, interweaving between the concrete skeleton and becoming a part of the skyline. 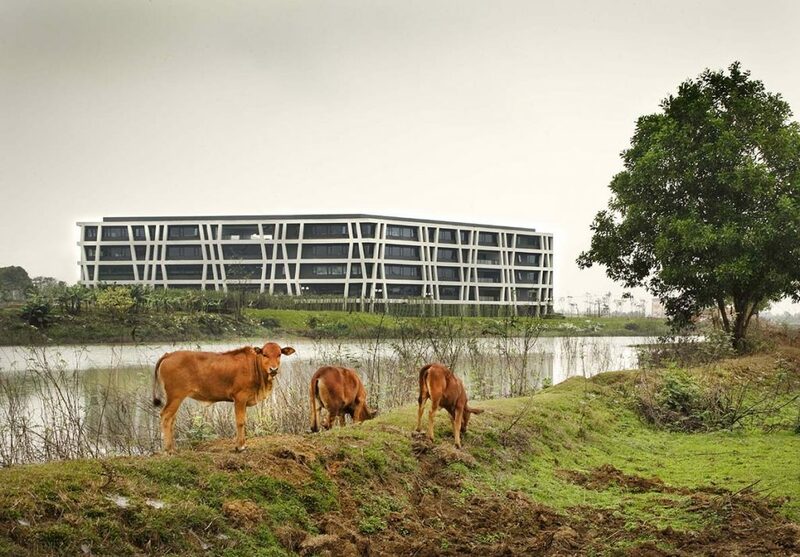 This curious building is part of Village 3 in the High-Tech Park master plan. Inspired by local, traditional North Vietnamese village features, the exposed courtyard radiates four pathways; connecting to the lush external landscape and acting as four entrances that reminisce the main gates of a traditional village. The grid structure of 12×25 meters allows a highly flexible and efficient use of space. Mixing green areas and open spaces they enhance the user’s experience through the building; inviting them to exchange, relax and enjoy the landscape. 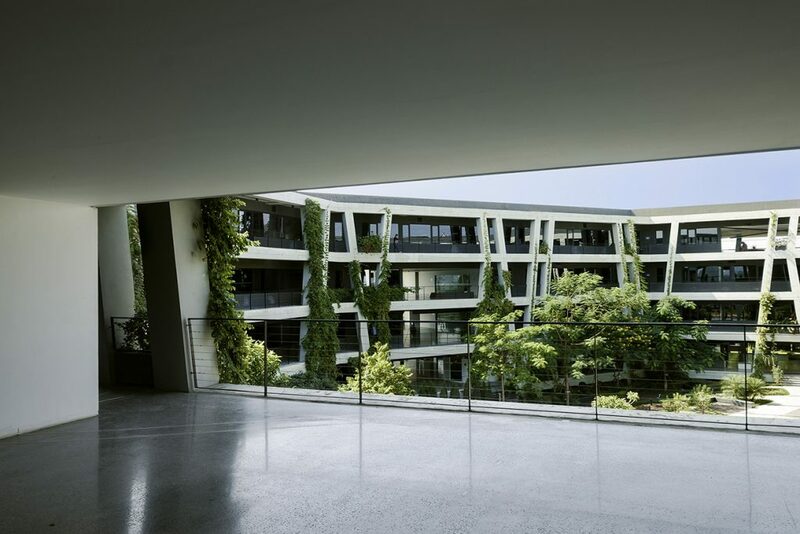 Sustainable design is ubiquitous; through maximising natural light, natural ventilation, gardens inside offices, sky gardens, rain water recycling and the use of local eco-friendly materials. The external layer acts as a key sustainable element of the building. It integrates climbing trees, acting as green protection against the sun, its density and thickness has been carefully adapted from different orientations and facade exposure. Together these elements create a dynamic green building that is integrated in nature and connected with its environment. Traditionally when a building was in a state of “ruin”, often the aftermath of abandonment and neglect, it became an inconvenience of sorts and disregarded. The very notion that a building has gone past its “expiry date” is truly archaic and in conflict with the fundamentals of “sustainability”.